Businesses have now realized the importance of branding because they want to establish a relationship based on trust and integrity with their consumers. Hence, visual components are necessary in making up a strong brand and that’s the reason marketing experts recommend on using your brand logo everywhere! Your logo identifies your business. It has to stand out, be unique and memorable. Designing the logo is a crucial process because you just have to get it right! You don’t want to risk your company’s sales by making common mistakes during the logo design process. For businesses, time is money. In this respect, they can take full advantage of services that can help create their customized logo design within 5 minutes. Here are some tips to make your logo unique and striking. The logo’s design relies majorly on the font and shape choice. Both need to be simple. It’s why you can easily recognize brands like McDonald’s and Apple just by the logos. Using too many fonts or colors in your logo design will just confuse the consumer and not successfully communicate the message you wish to send. A simple look tells the consumer you are organized. A cluttered logo sends a negative first impression to the consumer. So don’t rush when it comes to selecting the perfect font or shape, take your time and experiment to choose the perfect one. Also find a font or shapes suitable to the business and refrain from using very common ones. What is common between the Skype’s new logo and the logo for the London Olympics? Both of them seem to go overboard with special effects. If your logo design needs a lot of special effects to look amazing then the design is at fault. A well-designed logo doesn’t have to rely on special effects. Design the logo without any special effects that is what makes a logo design strong. Add the effects later when you have effectively created the logo in black and white. 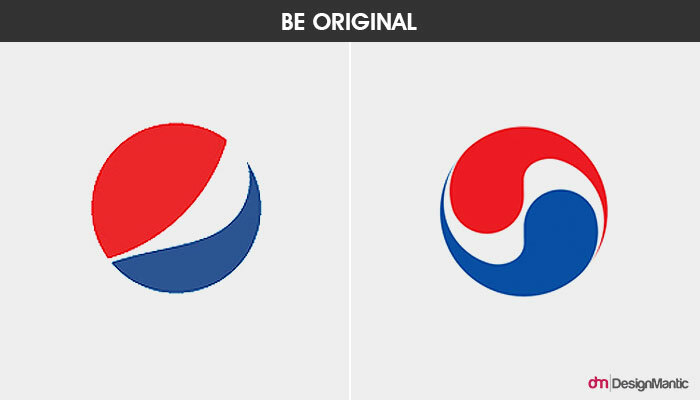 A strong logo design looks great even without the effects. Take a look at the first two logos. The first logo belongs to Pepsi and other belongs to Korean Air. Maybe one of them has copied it or maybe it is just a coincidence but with Pepsi being a stronger brand, Korean Airs’ logo doesn’t exude originality and gives a negative impression. The same seems to be the case for the logos of CNN and the FDA. You can see the words bleeding together into one in both cases. If you want to have a strong brand identity copying, stealing or borrowing the basic shape or idea of another brand’s logo is a unwise move on your part. Related: Make Your Innovative Logo Design In 5 Minutes! Your logo has to go everywhere! For this purpose it is resized for different stationery and promotional items. If you plan to use clipart or photos for your logo design then don’t. Use a software like Adobe Illustrator to design the logo because vector graphics make sure the image remains consistent when resized. Clipart in logos causes problems when reproduced. By using clip art you portray your brand is cheap! Brands like FedEx and Amazon embrace this concept with their logo designs and in the process, make them unique. Let your creativity flow while designing the logo. Compile multiple concepts and work on the ones you find best. If you are clever with making unconventional designs work then don’t be afraid to take the risk. A logo that has too many colors looks unprofessional. As a designer, you might be tempted to add as much color as you can. This is a mistake. Remember, it isn’t color that defines your logo’s identity; it is how it looks. Therefore it’s best that you focus on its shape before you break out the color palette. You can play around with different shades later but make sure that you stick to a simple color combo. You can see how WWF keeps its logo simple by taking advantage of negative space. Samsung follows suit with a blue and white scheme for its logo. You might be tempted to use more than two font styles to make your logo unique. This is a common mistake. Using too many fonts in a single logo is as detrimental to a design as overused fonts. It just makes your design look messy. It might also confuse viewers. Anyone who sees Nike’s Swoosh knows which brand it represents. Nike also gets props for the Swoosh symbol because no other brand had used it before. And symbols that have already been used become clichéd. If you planned to use any similar symbols like a thought bubble or arcs don’t. These have been too overused. If you absolutely have to use them, do so in a different way. Verizon has been criticized for its new stripped down logo. The ‘tick’ is a symbol that has been used by many other brands. The ‘eye’ in CBS’s logo, on the other hand, seems to be unnecessary. Other brands in broadcasting, such as CNN don’t need to rely on this imagery to tell audiences what they are. A typeface can make or break a logo design. Remember, your aim is to make your logo stand out. One way to make it unique is to come up with a typeface of your own. Using typefaces that are overused will hardly make it unique. Take a page from successful brands like Disney and Google. Hopefully these tips will help you out while designing an amazing logo. If you have more helpful tips , feel free to share with us in the comments section. I think you mentioning how the Korean airlines logo having a negative impression and being unoriginal is not true and insensitive. They are using the Korean flag, which I don’t know how you got as copying pepsi, or being unoriginal. I think there are better examples you can use to portray that example. We appreciate your comment. We did not mean to be insensitive with our content, therefore, I would apologies if it sounded that way. Now for the example, I am sure there are many examples that would fit the scenario described above but the reason we chose Korean Airline and Pepsi is because we felt both have a lot common. Not just color scheme but also the basic structure and that very curve is same too.